Press photographer Kulwant Roy’s prints and negatives remained forgotten in boxes for over twenty-five years after his death, until their inheritor Aditya Arya, a photographer himself, began cataloguing them. In the process, he discovered a rare and valuable visual archive, including many unpublished pictures, of a momentous era in India’s history. 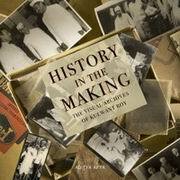 Some of the rare visual documentation includes the Muslim League meetings, INA trials, the signing of the Indian Constitution, as well as significant post-Independence milestones such as the building of the Bhakra Nangal Dam. Enriched by an insightful text, written by historian Indivar Kamtekar, this book is a collector’s item for anyone who wishes to discover the multilayered dimensions behind India’s ‘tryst with destiny’.